Wow! Just wow! She may not have crossed the line into heresy, but she is pretty much right on top of it. Because again, she has claimed that we can do with our minds what only God can do. We can not create matter. The only being that has every created matter is God himself, in Genesis. 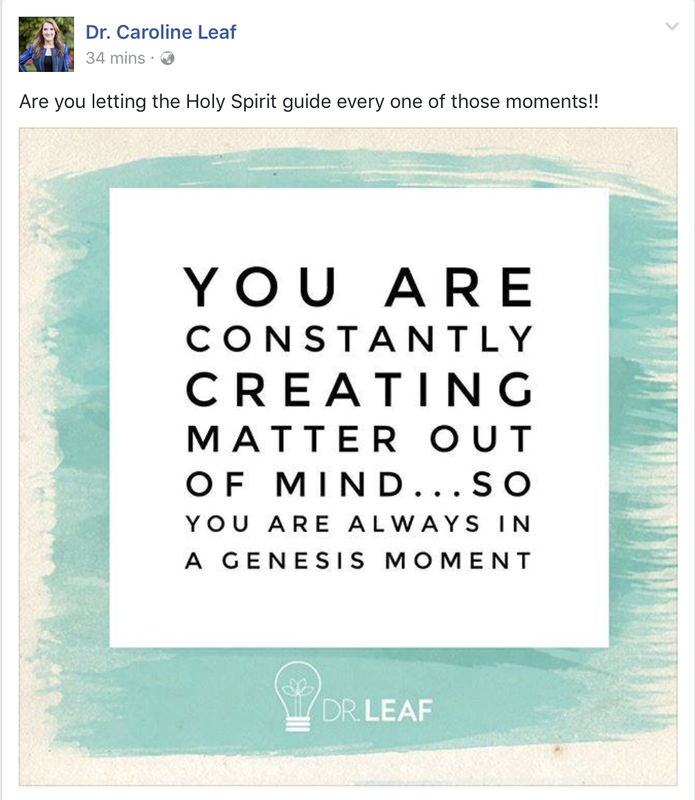 In adding her little “Genesis moment” comment, she’s essentially equating our mind with God’s. She might as well just come out and say, “We create matter with our minds, so we are like God”. There’s a real Genesis moment where people thought they were like God: “‘You will not certainly die,’ the serpent said to the woman. ‘For God knows that when you eat from it your eyes will be opened, and you will be like God, knowing good and evil.’” We all know how that eventually turned out. Ultimately it begs the question, where are the church leaders? I don’t hear anyone denouncing Dr Leaf’s comparison of our mind to God’s. How much is too much? When will they say, “Enough’s enough”? It should have been said already, but sadly, with every unscientific, unscriptural meme that Dr Leaf publishes, the impotence and inaction of the church to becomes more and more painfully obvious. Please church leadership, please take a stand, before it’s too late. This entry was posted in Biological, Caroline Leaf, Spiritual and tagged caroline leaf, cognitive neuroscientist, criticism, dr caroline leaf, Dr Leaf, Facebook, Genesis, heresy, matter, meme, mind, pseudoscience by cedwardpitt. Bookmark the permalink. The Big Bang theory is so much more logical. We no longer need fairytales about apples and the weaknesses of men and women. This is the 21st century. My mind refuses to even entertain such fallacies. Each to their own I suppose but no more indoctrination by fear and “love thy neighbour ………” That is the maxim of life regardless of religion. Hey there Dee. I agree with you, “Love thy neighbour” should be the maxim of life irrespective of one’s religious beliefs.